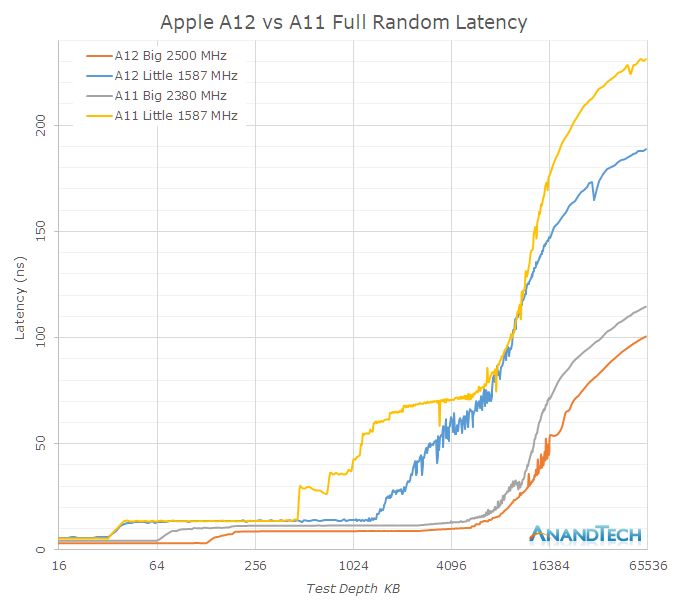 Both the A11 and A12’s maximum frequency is actually a single-thread boost clock – 2380MHz for the A11’s Monsoon cores and 2500MHz for the new Vortex cores in the A12. This is just a 5% boost in frequency in ST applications. When adding a second big thread, both the A11 and A12 clock down to respectively 2325 and 2380MHz. It’s when we are also concurrently running threads onto the small cores that things between the two SoCs diverge: while the A11 further clocks down to 2083MHz, the A12 retains the same 2380 until it hits thermal limits and eventually throttles down. On the small core side of things, the new Tempest cores are actually clocked more conservatively compared to the Mistral predecessors. When the system just had one small core running on the A11, this would boost up to 1694MHz. This behaviour is now gone on the A12, and the clock maximum clock is 1587MHz. The frequency further slightly reduces to down to 1538MHz when there’s four small cores fully loaded. The Vortex cores have only a 5% boost in frequency over the Monsoon cores, yet the absolute L2 memory latency has improved by 29% from ~11.5ns down to ~8.8ns. Meaning the new Vortex cores’ L2 cache now completes its operations in a significantly fewer number of cycles. On the Tempest side, the L2 cycle latency seems to have remained the same, but again there’s been a large change in terms of the L2 partitioning and power management, allowing access to a larger chunk of the physical L2. I only had the test depth test up until 64MB and it’s evident that the latency curves don’t flatten out yet in this data set, but it’s visible that latency to DRAM has seen some improvements. The larger difference of the DRAM access of the Tempest cores could be explained by a raising of the maximum memory controller DVFS frequency when just small cores are active – their performance will look better when there’s also a big thread on the big cores running. The system cache of the A12 has seen some dramatic changes in its behaviour. While bandwidth is this part of the cache hierarchy has seen a reduction compared to the A11, the latency has been much improved. One significant effect here which can be either attributed to the L2 prefetcher, or what I also see a possibility, prefetchers on the system cache side: The latency performance as well as the amount of streaming prefetchers has gone up. To compare the backend characteristics of Vortex, we’ve tested the instruction throughput. The backend performance is determined by the amount of execution units and the latency is dictated by the quality of their design. The Vortex core looks pretty much the same as the predecessor Monsoon (A11) – with the exception that we’re seemingly looking at new division units, as the execution latency has seen a shaving of 2 cycles both on the integer and FP side. On the FP side the division throughput has seen a doubling. Monsoon (A11) was a major microarchitectural update in terms of the mid-core and backend. It’s there that Apple had shifted the microarchitecture in Hurricane (A10) from a 6-wide decode from to a 7-wide decode. The most significant change in the backend here was the addition of two integer ALU units, upping them from 4 to 6 units. Monsoon (A11) and Vortex (A12) are extremely wide machines – with 6 integer execution pipelines among which two are complex units, two load/store units, two branch ports, and three FP/vector pipelines this gives an estimated 13 execution ports, far wider than Arm’s upcoming Cortex A76 and also wider than Samsung’s M3. In fact, assuming we're not looking at an atypical shared port situation, Apple’s microarchitecture seems to far surpass anything else in terms of width, including desktop CPUs.